Kids’ bedroom furniture doesn’t get much cooler than this. The Volkswagen Kombi may no longer be in production, but that hasn’t stopped designers incorporating the iconic vehicle into all manner of things. 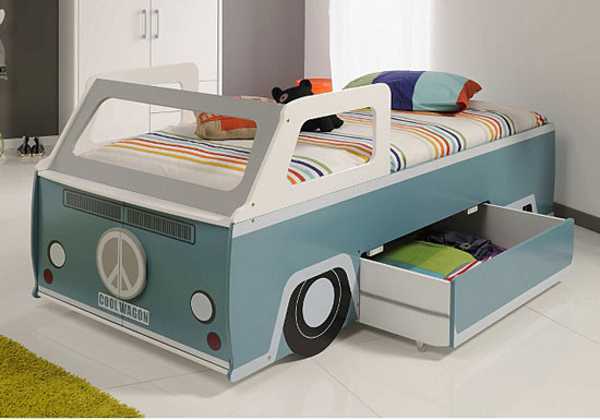 The Camper Van Bed by George Home is easy on the eye, playful and functional. It has a built-in drawer, accessible from either side and a cupboard at the front. What I like about this design is that it seems relatively easy to change the sheets – something that can be a struggle with more elaborate children’s beds. The Camper Van Bed is priced at £349, but you’ll have to organise a reshipper to get one to Australia.